The remarkable Nehassaiu DeGannes in S&Co. 's Or tied for best supporting actor on a main stage. Pirates of Penzance at Barrington Stage ran the table in awards. 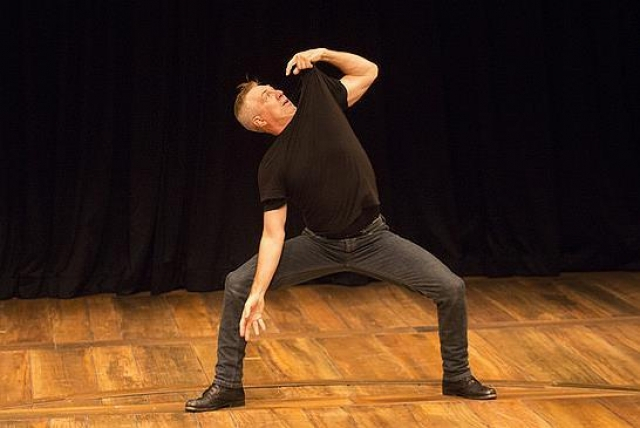 Stephan Wolfert was galvanic in his one man show "Cry Havoc" at S&Co. Fiorello moved from the Unicorn to an Off Broadway run. 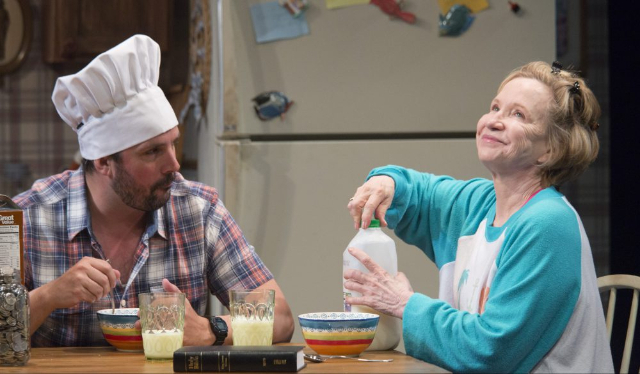 Debra Jo Rupp was enchanting in Kilberly Akimbo at Barrington Stage. With formidable sweat equity the First Annnual Berkshire Theatre Awards has been launched. 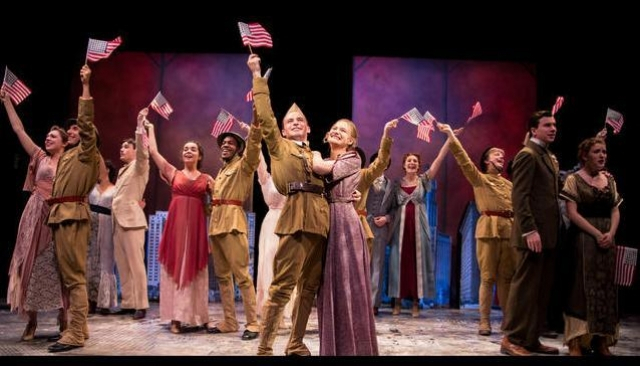 The winners have been announced and two of the four major Berkshire companies, Barrington Stage Company and Shakespeare & Company have dominated. While 17 critics have voted not all of them saw most of the nominated productions. This is particularly true for companies on the fringes of the Berkshires. It is likely that the majority of critics, however, saw most of the productions of the four major companies which were well represented in nominations. 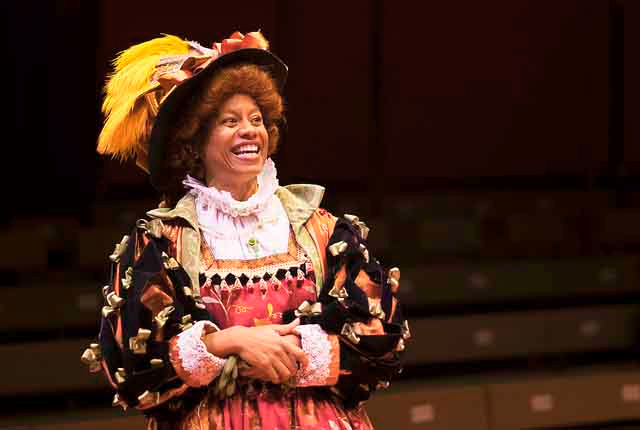 While often touted for its New York and Broadway connections the surprise of this first annual slate of winners is that Williamstown Theatre Festival sailed wide of the mark. In general, its marquee appeal failed to produce winners. It is a notable, for example, that its production of Tennessee Williams' The Rose Tattoo did not claim kudos for its star Marisa Tomei. The other Williams production, Cat on the Hot Tin Roof, at Berkshire Theatre Group was nominated but failed to win. While WTF had strong productions in its smaller Nikos Stage the two Main Stage offerings other than Rose Tattoo, a hit with critics and audiences, ranged from bad to worse. Its Nikos musical Poster Boy, which was not open to review, according to media consensus would have won for best new musical had it been eligible. That award went to Barrington's Broadway Bounty Hunters which got mixed reviews. At the last moment Julianne Boyd jumped in as director to save the show and surprisingly won for that category. The dominance of Barrington Stage comes as no surprise to Berkshire theatre insiders. Unlike NY oriented WTF, artistic director, Julianne Boyd, has often stated a policy of not casting marquee actors. This raises costs as well as expectations. 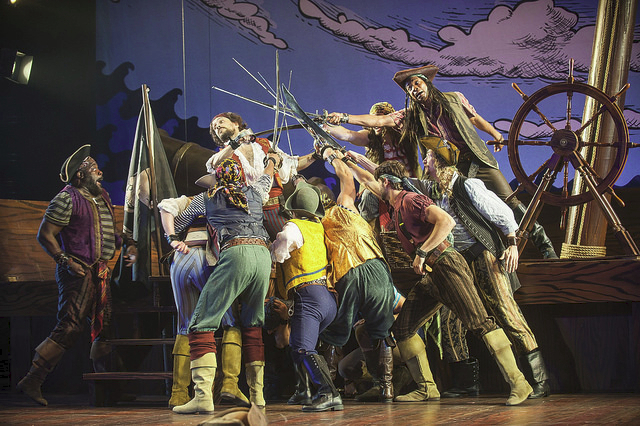 The team for Pirates, however, was comprised of Tony winners and Broadway veterans. It was far and away the best reviewed and most popular production of the season. In any other year, however, a delicious and raucous production of Little Shop of Horrors by Berkshire Theatre Company deserved to be a winner. While it was presented at the large Colonial Theatre there was a feisty production of the musical Fiorello which was compressed effectively into its small Unicorn Theatre. The show traveled to Off Broadway this fall where it earned positive reviews. To say the least Shakespeare & Company has gone through several seasons of turbulence. Despite patched up administration and the announcent of yet another artistic director, overall, as reflected by nominations and winners the company managed a strong season. There were remarkable performances including Johnathan Epstein (didn't win) in Merchant of Venice, the incredible solo of Stephan Wolfert in Cry Havoc and the over the top Nehassaiu DeGannes in Or (in a tie with Scarlett Strallen in The Pirates of Penzance). At the beginnng of the season The Boston Globe wrote a feature noting women as artitic directors of the four major equity companies. At S&Co. Ariel Block shared those responsibilities with Johnathan Croy. Add to that mix Kristen van Ginhoven, Co-founder and Artistic Director of WAM Theatre, which mandates productions by and about women and girls. Not surprisingly that equated to a season notable for message plays and feminism. Often one emerged from an evening of theatre feeling more educated than entertained. Some of these productions proved to be remarkable and memorable. While others felt misdirected, preachy and flat. Given the horrific state of racism, xenophobia, sexism and current politics perhaps Berkshire theatre aptly reflects the national zeitgeist. In putting together seasons artistic directors have the option to enforce their social and political agendas. Ultimately, audiences decide on the success or failure of programming. Moving into the next season artistic directors have to explain empty seats to their boards. It is interesting, for example, that for its three Main Stage productions WTF featured strong roles for women. Theatre goers noted the lack of a mainstream musical or an "entertaining" show. By default that was Marisa Tomei in Rose Tattoo. Critics noted her strong but generally miscast performance. She was edged out by Tamara Tunie in American Son. Many felt that the ambitious Nikos program was superior to what appeared on the mainstage. Of course there is always next year. Below is the press release for the awards. Berkshire County, MA [October 17, 2016] – The winners of the First Annual Berkshire Theatre Awards have been announced. Seventeen arts journalists voted on 120 nominees in 25 categories chosen from artists in the 75 live theatre productions mounted in Berkshire County and adjacent areas between October 1, 2015 and September 30, 2016. The winner of the special Larry Murray Award, to be given to a person or theatre project that advances social, political, or community issues, will not be announced until the Winners’ Celebration at 5 pm on November 13 at Mr. Finn’s Cabaret in Pittsfield. Nominees for the Larry Murray Award are Kristen van Ginhoven, Co-founder and Artistic Director of WAM Theatre, and Julianne Boyd Artistic Director of Barrington Stage; and the three Vermont theatre companies that teamed up to produce all three plays in Alan Ayckbourn’s The Norman Conquests this past summer – the Dorset Theatre Festival, Northern Stage Company, and the Weston Playhouse Theatre Company. "If these awards indicate who is doing the best work in the Berkshires, then Barrington Stage and Shakespeare & Company have to be at the top of anyone's list,” said awards organizer Larry Murray of BerkshireOnStage.com. “Those two companies received the majority of wins, with WAM Theatre and Berkshire Theatre Group also receiving recognition of their work. That the Williamstown Theatre Festival came close in many categories without securing its own place in the awards will undoubtedly be cause for speculation. It seems the critics have spoken." There were tie votes in both the male and female Outstanding Support Performance categories, and many of the votes were extremely close. With regional theatres employing hundreds of professionals, making theatre is an important cog in the area’s cultural economy. In fact, many consider the region a hot spot for Broadway bound shows, and a popular summer destination for theatre-goers from around the nation. The Berkshire Theatre Awards voters included Mark G. Auerbach of the Westfield News Group, Peter Bergman of Berkshire Bright Focus and the Berkshire Edge, Jeffrey Borak of the Berkshire Eagle, theatre historian Bob Bruyr, Dan Dwyer of Off Script, Helen Epstein of Arts Fuse, Bob Goepfert of the Troy Record and WAMC, Charles Giuliano of Berkshire Fine Arts, Rex Hearn of the Berkshire Record, Macey Levin of Berkshire on Stage, Gloria Miller of Curtain Up, Larry Murray of Berkshire on Stage, Chris Rohmann of the Valley Advocate, Fred Sokol of Talkin’ Broadway, Stephen Sorokoff of Broadway World, Bob Sugarman of Theatre Talk, and Sally Sugarman of WBTN and More Theatre Talk. Also participating in the program but not voting are Gail M. Burns and Ed Sedarbaum. The complete list of nominees follows, with the winners in Bold Face.